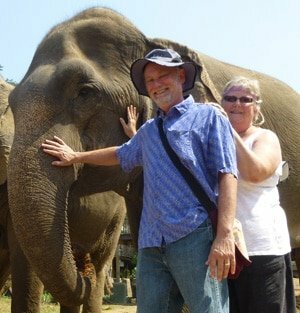 Bali and its warm, friendly people and breathtaking landscapes amazed us daily, during our time in Ubud and the surrounding countryside. Dazzling flowers and lush green plants were everywhere we turned. 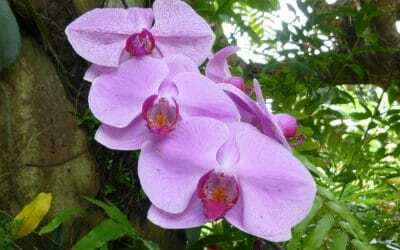 Beauty abounds in Bali, from the tiniest flower to the verdant rice fields and huge tropical blooms. The Balinese people view the creation of art as a religious practice and take care and pride in each offering they craft. 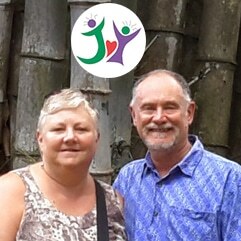 Each day, as we walked around Ubud, or toured the region by motorbike or car, we were astounded anew by the gorgeous colors, the lively villages and the spectacular scenery, architecture, carvings and paintings. 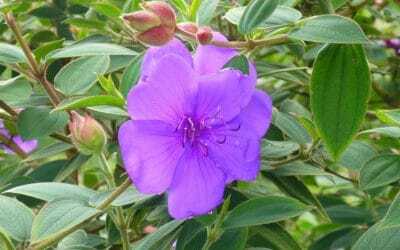 The Princess Flower, also known as the Glory Bush grows wild in Bali, Indonesia. This stunning specimen was photographed on the roadside in the village of Tirta Tiwar. 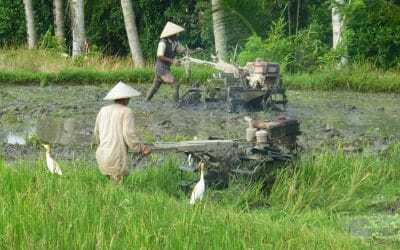 In Bali, farmers use gas driven plows, looking like giant lawnmowers, to till a muddy rice field. White egrets follow them around, eating the small creatures that are unearthed. 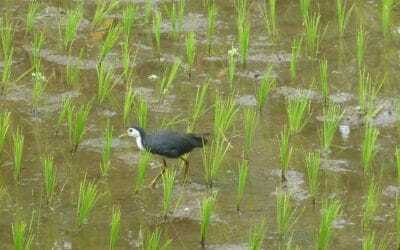 The White-breasted Waterhen is a common sight in the rice fields of Bali, Indonesia. They feast mainly on the insects in the shallow water. 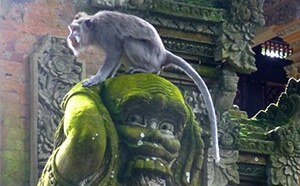 The Sacred Monkey Forest in the city of Ubud, Bali is a lush jungle area filled with troupes of monkeys. But visitors should be warned to be wary of the indigent monkeys, which are not friendly. 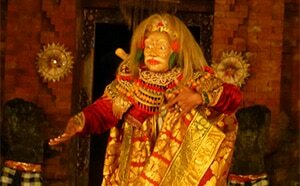 In the classical Balinese dance called Topeng Tua the dancer performs slow dramatic gestures, including some, meant to be humorous. Performances are filled with stunning costumes and unique music. The temple Tirta Empul is one of Bali’s most revered water temples. Here people with both physical and emotional afflictions can come to make offerings, pray and bathe. Gunung Agung (left in this photo) is Bali’s most revered mountain. It lost it’s top in the 1963 eruption and is considered still active. 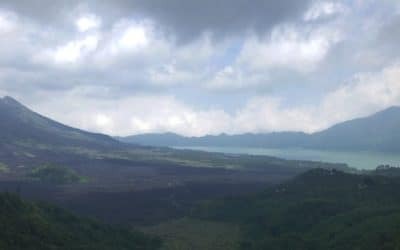 To it’s right is Batur and then Gunung Abang. Bali is home to a few really world class art collections. The Agung Rai Museum of Art in Ubud is filled with wonderful paintings and sculpture by local and international artists. 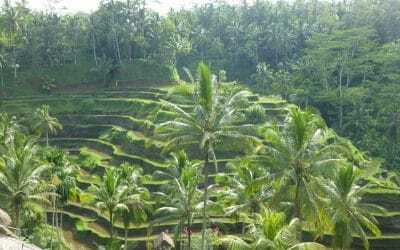 Rice is the staple food for Indonesia and rice fields can be found all over the island of Bali. In each of these fields can be seen rice in every stage of development, from newly planted to ready to harvest. 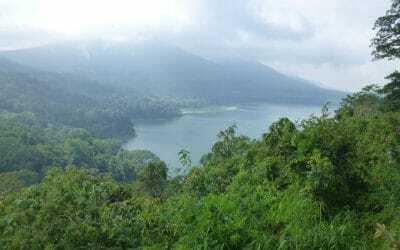 Located in the mountains of Central Bali in the Bedugul region, Lake Beratan is considered a holy place by the Balinese and is a major water source for all of Bali.